The Asian Civilisations Museum in Singapore has an impressive collection of ancient ornament from South and Southeast Asia. Early Javanese pieces like this large Sri ring (7th-9th century), are one of the collection’s strengths. 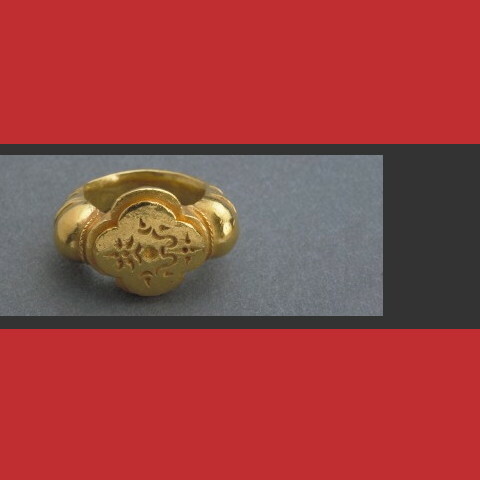 Many of the most beautiful gold ornaments exhibited, including this ring, were part of a substantial gift by Mr and Mrs Andy Ng in the late nineties. When I visit Singapore I always make time to visit the museum to ogle the gold. It’s no longer necessary to visit in person, though. Go to SGCool (Singapore Collections Online), where you can browse a large online repository of art and artefacts in the collections of numerous Singapore museums. We love online collections, they are a rich source of inspiration and information.